I found this recipe in Mallika Badrinath's book on Microwave cooking..It sounded too simple to make and a quick breakfast to make especially during busy mornings..It also was something different from the normal upmas we make..It was spicy and tangy..Here goes the recipe.. Mix 1 teaspoon of oil, mustard seeds, urad dhall and bengalgram dhall and micro on high for 3 minutes in a half-closed bowl..
Add the onions and micro high for 2 minutes in the half closed bowl..
Add the remaining ingredients (except ghee and coriander leaves), mix well and micro on high for 5 to 6 minutes in open bowl, stirring twice in between.. Mix the ghee and coriander and microwave for 1 minute in the open bowl.. Serve hot with pickle or chutney of your choice.. This is my entry to WBB - Microwave foods hosted by Easycrafts.. The chayote is a member of the squash family. It is also referred to as a "vegetable pear" or chcocho or chow-chow.The flesh is quite crisp something like a water chestnut.Chayotes come in two common varities, the smooth variety shown below and a prickly variety (covered in spines).Medicinal uses of the chayote included a tea made of the leaves is reported to dissolve kidney stones as well as a treatment for arteriosclerosis and hypertension.The chayote can be eaten raw in salads, or stuffed and baked. Other preparations include mashing, pickling, frying or boiling. The plain squash tends to be bland and benefits from "aggressive" seasoning. I made kootu with chow-chow and it tasted wonderful..I got this recipe from my mother..It tastes good with any rice or dhall..
To the split moong dhall add turmeric powder and a little water and allow it to cook until it is half cooked..( I microwaved it for 2 minutes)..Add the chopped chow-chow salt and half a cup of water,cover and cook for 6 to 7 minutes. Grind together the coconut,roasted urad dhall, green chillies, cumin seeds in a blender and add to the chow-chow.Bring it to a boil and take off from the heat..
As per the rules I have to list my favourite yummy-licious desserts that I have prepared or eaten and pass the award to four of my fellow bloggers.. I had to pass this award to four yummy blogs..Selecting four blogs from numerous yummy blogs was a bit tough job.. The person who receives the award should display the "Yummy Blog !" 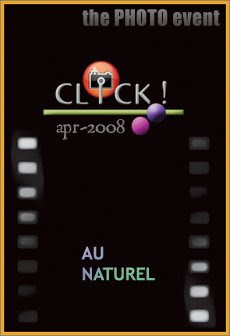 logo on their blog and also the meaning of the award which is "Yummy blog award is the award given to the blog with most yummy recipes/photos". The receiver should also quote their favorite yummy-licious :) dessert(s) that they have ever prepared/eaten. Don’t restrict yourself to any dessert, chocolate bars also welcome. I have been tagged by Farida for a Meme called Top ten pics..Though am not too good in photography,I have listed my 10 best shots in my blog...It might be helpful for those who have missed seeing them..So here I go..You can just click the pictures to view the recipes..
Now I would like to tag the following friends who have wonderful pics in their blogs to list their 10 best shots..
Do it only if u are interested..
Coming to my next Meme's..I was tagged by Uma for the following Meme which was really fun.. Petrol, smell of rain,roses,coffee and yummy food! Streaks of brown may be..
A friendly person who makes wonderful chutneys! I would like to tag the following friends..Do this meme only if your interested..
India being an abode of spices I feel that Biryani is a dish that with a medley of vegetables and spices and best represents Indian cooking..
Clean and soak the basmati rice in water for about 30 minutes. In a large vessel add the ghee and roast the cashews..Once they turn golden brown add all the spices and saute until you get a nice aroma of the biryani. Add the onions and saute till transparent..Add the Ginger garlic paste and saute. Add the cut vegetables and saute for two minutes. Add slit green chillies and coconut milk and bring to a boil. Add the basmati rice along with salt and turmeric powder. Add 3 1/2 cups water and close the pressure cooker..After 15 minutes stop cooking..The rice should be done by this time..Add a spoon of lemon juice and mix well..
Garnish with coriander and mint leaves.. Serve hot with raita of your choice.. I also dedicate this yummy vegetable biryani to Dhivya who is celebrating her birthday tomorrow..Happy Birthday Dhivya! 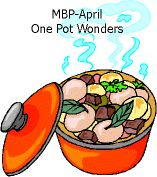 This is my second entry for MBP-One pot wonders hosted by Pavani this month.. I adopted the recipe for Potato fried rice from Dhivya's blog and I was happy that I tried it.. It was super delicious and an easy one to prepare.. It was a perfect one dish meal..Thanks Dhivya for sharing it.. I followed the same recipe except that I added some french beans to it..
You can check out the recipe here.. Anyone who loves potatoes will definitely love this rice..It was fun participating in this event and thanks to Pavani.. This melt-in-your-mouth cookie is one the best cookies I have ever had..While I was searching for recipes with clove I landed upon several recipes for greek clove cookies and made my version tweeking the recipes a bit..They tasted really too good..The recipe called for brandy which I replaced with vanilla extract..They tasted best with tea..They are also called as Greek tea cakes.. Soften the butter and mix it with the sugar in a large bowl. Beat it till you get a creamy consistency. Add the flour,vanilla,ground cloves and beat well until they are well mixed. Cover and refridgerate for about 1 hour until it becomes firm. Place 1 inch apart onto ungreased cookie sheets. Bake for 15 to 17 minutes or until very lightly browned. Cool completely. Sprinkle the cookies with the mixture of powdered sugar and ground cloves.. This popular melt-in-your-mouth Greek cookie, Kourabiedes, is often served at festive holiday celebrations. The cookie is always sprinkled with powdered sugar and the top is either sprinkled with ground cloves or a whole clove is inserted in the top. To make these cookies softening butter is an important step..So not melt butter in the microwave as the cookies do not retain their shape..Instead, allow it to soften by rmoving it from the fridge and allowing it to stand for 30 to 45 minutes at room temperature..This yields perfect cookies.. This is my entry to Think Spice: Think Cloves hosted by Gretchen.. These California oranges are my entry for Click - Au Naturel hosted by Jai and Bee of Jugalbandi..I love the colour of these oranges and freshly squeezed orange juice is a part of our every day breakfast.. This orange juice is a part of our everyday breakfast..Earlier we used to have the store bought ones but found that it was loaded with sugar and preservatives..Instead we got a citrus juicier and being in California we get fresh naval oranges almost all the year round..
We prefer to have it fresh without adding any sugar..
For the best nutritional value and taste, juice only enough navel oranges to drink and enjoy right away! Navel orange segments are healthy and fun kid foods for snacks and lunches, that pack and travel well. Peel the orange, then gently separate the fruit along the natural divisions. Try this guilt-free treat: cut navel orange segments into low- or nonfat chocolate yogurt. Toss some navel orange sections on your favorite cereal, pancakes and waffles.. I was thinking what I would prepare for the EC's Fun n Sun Event..
Realised that nothing would be more appropriate than this refreshing, chilled,freshly squeezed,orange juice..Sometimes I add a dash of cinnamon and a mint leaf to make it more refreshing..So here is my entry EC..
BTW,Check out my new favicon in the address bar! This soup is fairly easy to make and is delicious and creamy..It can be accompanied with garlic bread and shredded cheese to add more richness..Heavy cream can be added to give more thickness and flavour to the soup..Any variety of mushrooms can be used..I used a combination of portabella and button variety..Serves as a good appetizer and also as a late-evening meal.. Melt the butter in a vessel and add the chopped onion and garlic and saute till they turn translucent..Add the mushrooms and saute till they turn tender..Combine the flour to this mixture and then stir in the stock and mix till a smooth consistency is obtained..Water can also be added in the place of stock..Bring to a boil..Cook and stir for 2 minutes or until the soup gets thickened..Stir in the cream, salt and pepper..You can also garnish this with your favorite herbs..
Simmer for 10 minutes and serve hot with any toast of your choice.. I wanted to try something different for dinner..Didnt have much of veggies in the fridge..I had paneer in hand so I decided to make paneer parathas..They were too good than I had expected..This is how I prepared them..
Knead the dough at set it aside for at least half an hour..This makes really soft parathas.. Meanwhile, grate the paneer and mix the other ingredients together..Make a small ball with this about 1.5 inches in diameter..Divide the dough into small balls.Knead out each ball into circles of 7 to8 inches diameter with the help of a rolling pin.Place he paneer mixture in the middle and close it by bringin the ends to the center to form a dumpling.Apply some more flour on the dumpling and knead it out again taking care the mixture doesnt come out..
Heat a nonstick pan and melt some butter and cook the paratha o both sides,two minutes on each side.. Serve hot with yoghurt and pickle/chutney of your choice.. The paneer can also be substituted by grated cheese and omitting the salt. These granola bars are a quick breakfast in busy mornings..No cooking and hurry burry work needed in the kitchen..I was inspired to prepare this on seeing the healthy odwalla bars..It can be prepared and packed earlier..They are simple,satisfying..It also gives the energy needed in the morning as it contains nutritious ingredients like oats,honey,almonds etc..It can be prepared with your favorite ingredients on hand.this is my version..It took me very less time to prepare this and it tasted wonderful..I could nt resist myself from eating this..I prepared this in the afternoon and I finished three bars by that evening itself..Couldnt wait till the morning.. Some other options - Flax seeds, Sunflower seeds,Wheat germ,oat bran etc..
Preheat the oven to 350 F.. Combine together the oats, almonds and other optional ingredients added.. Grease a baking sheet and spread this mixture and bake for 6 to 7 minutes..Mix once in between while baking.. In the meantime, heat a vessel and add the butter,brown sugar,honey and vanilla extract together..Bring it to a boil and switch it off..The sugar should have dissolved well..
Now fold in the oats-almond mixture and the dried fruits..Mix thoroughly with a spatula till everything has combined together.. Transfer this mixture to a greased baking dish and press down and level the mixture with the back of a spatula..
Bake at 350 F for 20 minutes..Cool completely..
Cut down into bars of required sizes..Cut only after it has cooled well..I got 5 long bars for the amount of ingredients mentioned above..
Store in airtight containers or wrap them in foils..
Just one granola bar and a cup of milk would be a filling breakfast..
and Show Me Your Breakfast event. I was searching for some bengali dishes to post them for RCI-Bengal..Came across this easy yet delicious dish which is a tasty accompaniment to rotis,chapathis and rice..It turned out super delicious and took less time to prepare too.This tastes best when baby potatoes are used. Since I didnt have them in hand I used the normal ones..
Heat 2 spoons of oil in a pan and add the potatoes..Fry them for about 5 to 6 minute until the oil coats them evenly and slightly roasts the potatoes..do this in medium heat so that the tomatoes do not get burnt..Keep the potatoes aside..
Now add the remaining oil in a vessel and splutter the cumin seeds..Add the onions and saute till they turn translucent..Add the ginger garlic paste followed by the tomatoes..Cook for a minute. Add all the dry spice powders and salt and saute for a minute..
Noww add the potatoes and mix well..Add half a cup of water,cover and cook till the potatoes turn soft..Add the yoghurt/curd and simmer for about 5 minutes..Powdered cashews can be added to the gravy to give more richness and flavor to the dish.. 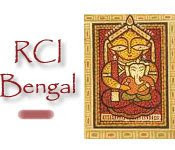 This goes off to RCI-Bengal hosted by Sandeepa.. 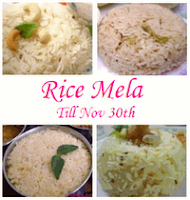 This is my favorite rice and I prepare it very often at home..I love to have it with potato chips and onion raita..It is suitable for lunch box meals too..It can be prepared when you are short of ingredients in the pantry because this needs very few ingredients..
Puree the tomatoes in a mixie..
Add oil or ghee in a pressure cooker and roast the cashews until golden brown..
Then add the cumin seeds..Once they splutter add the onions and saute till they turn translucent..
Now add the tomato puree and cook for a minute.. Instead of pureeing the tomato you can also add finely chopped tomatoes.. But you will have to reduce the amount of water as the tomatoes give off some water..
Add the garam masala, coriander, cumin, turmeric and chilli powder..Also add salt..
For two cups basmati rice add four cups water..I added 3 1/2 cups water and 1/2 cup milk.. This gives more richness to the rice..Close the pressure cooker and cook until three whistles..
Garnish with one teaspoon ghee and coriander leaves.. Serve with raita of your choice.. This is my entry to LiveSTRONG With A Taste Of Yellow - 2008 hosted by Barbara.. I love garlic bread a lot especially as an accompaniment to soups and pastas..
Decided to try it at home..I made french bread last week at home and dint take photos as I didnt have the idea of blogging them..Later I decided to make garlic bread with those and they came out too good..So hurriedly I took some snaps and here is how I prepared it.. It is very quick to prepare if you have even store brought french bread at home..
when french bread is used. Combine the chopped garlic cloves,oregano,basil and parsley in a blender. Preheat oven to 350 degree fahrenheit.. Apply sufficient amount on the bread slices and then apply this blended mixture over it.. 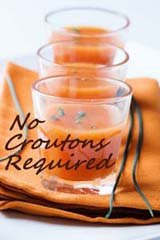 Serve them hot along with soups, pastas or any dish of your choice.. This is very much similar to falafel found in mid-east cuisines..I have made this in an Indianized way..It is easy and quick to prepare and also serves as a tea time snack..It is nutritious as it is loaded with proteins..
Soak the chickpeas overnight..You can also use canned chickpeas instead.. Drain the water and pressure cook the chickpeas until they turn soft.. Drain the water and combine with the onion, garlic, salt, coriander powder and cumin powder and blend it in a mixie to a coarse paste..
Add flour and chopped coriander leaves and make into small balls..
Fry them for about 5 minutes until they turn golden brown.. Serve with tea or with hummus and pita bread.. This is my entry to WHB hosted this week by The Well Seasoned Cook.. I always prepared one pot dishes as they are time saving and effortless to prepare,yet delicious.. When I browsing for such dishes I tumbled upon this pulao from Hooked on Heat which resulted in a yummy,fulfilling meal..Here is how I prepared it.. In a pressure cooker add ghee/oil and fry the cashews..Once they turn golden brown, add the cumin seeds and cloves..Then add the onions and ginger garlic paste and saute till they turn translucent. Then add the mushrooms and fry till they turn brown and all the moisture evaporates. Then add the corn and saute for a minute. Add all the spices and salt and allow them to cook for a minute. Add 3 1/2 cups water and once it begins to boil add the rice and peas..
Close the pressure cooker and cook for two whistles..
Do not overcook..Garnish with coriander leaves and serve with raita.. This is my entry to MBP-One pot wonders hosted this month by Pavani of Cook's Hideout..